In the latest allegations of sexual abuse to hit the U.S Catholic Church, Bishop John Jenik, an auxiliary bishop in the Archdiocese of New York, has been accused of sexual abuse and is now under review by the Vatican. In a letter dated Oct. 29, sent to parishioners at Our Lady of Refuge parish in the Bronx, Cardinal Timothy Dolan announced that an allegation had been made against Auxiliary Bishop Jenik through the archdiocese’s Independent Reconciliation and Compensation Program (IRCP). Auxiliary Bishop Jenik, who is 74 years old, served as a pastoral associate at the parish from 1978 to 1985, and was appointed pastor in 1985. In his letter, Cardinal Dolan noted that this was the first allegation made against Auxiliary Bishop Jenik. “Although the alleged incidents occurred decades ago, the Lay Review Board has concluded that the evidence is sufficient to find the allegation credible and substantiated,” he wrote. In a letter by Auxiliary Bishop Jenik accompanying Cardinal Dolan’s correspondence – which he referred to as “the hardest letter I have had to write in my 48 years of priesthood” – he denied the allegations. “While I have the utmost respect for the both the IRCP and the Review Board, and know that they have a great burden to confront the evil of sexual abuse, I continue to steadfastly deny that I have ever abused anyone at any time,” he wrote. Related: Cardinal Dolan also posted a video message sharing the news about Auxiliary Bishop Jenik. Click here. Auxiliary Bishop Jenik went on to note that he was stepping aside and relocating while the matter is investigated. In 2006, Cardinal Edward Egan appointed Jenik as vicar for the Northwest Bronx. 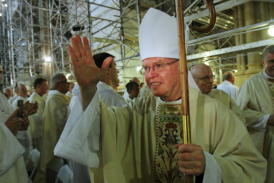 He was made a bishop in 2014 by Cardinal Dolan and continues to serve as vicar for the region. He, along with two other New York auxiliaries, were the first bishops to be ordained by Cardinal Dolan after he arrived in New York in 2009. Cardinal Terence Cooke ordained Jenik a priest of the archdiocese of New York in 1970. His pastoral and ecclesial career has been primarily based in the Bronx, and he’s widely known in the area for his work on affordable housing and as an outspoken advocate against city crime and drugs. According to the archdiocese, allegations are reported to the local district and investigated by a lay team of independent experts. Earlier this year, it was this same program that led to the downfall of now-former Cardinal Theodore McCarrick. A report of abuse from nearly 50 years ago while McCarrick was then a priest of the archdiocese, led to subsequent revelations of decades of sexual abuse against former seminarians and at least one minor. In September, the Attorney General of New York State, Barbara Underwood, issued subpoenas to all eight of the state’s Catholic dioceses as a part of a state-wide civil investigation of the Church’s handling of sexual abuse cases. The state’s Catholic dioceses have pledged full cooperation with the investigation. In his letter to Jenik’s parishioners, Cardinal Dolan encouraged anyone else with information or concerns regarding the bishop to contact the Bronx District Attorney, as well as the archdiocese’s Victim Assistance Coordinator. I.am taking a walk on this beautiful day to pray for the Church, the Bishop and the victims of abuse. May Almighty God and Father have mercy o us all.